Anthem: "Inno Nazionale della Repubblica"
"National Anthem of the Republic"
San Marino, officially the Republic of San Marino Italian: Repubblica di San Marino, also known as the Most Serene Republic of San Marino, is a country in the Apennine Mountains. Contained in an area of 24 miles square, it is a landlocked enclave, completely surrounded by Italy. As one of the European microstates, San Marino has the smallest population of all the members of the Council of Europe. Tourism is the country's economic mainstay, providing over 50 percent of its GDP, with 3 - 4 million tourists visiting annually. Banking is also important. San Marino is an enclave (a country geographically surrounded by another) in Italy, on the border between the region of Emilia Romagna and Marche. It covers an area of approximately the size of Syracuse, New York. It is the third-smallest country in Europe, with only Vatican City and Monaco being smaller. Its topography is dominated by the Apennines mountain range, with an otherwise rugged terrain. The highest point in the country, Monte Titano, is situated at 2,457 ft. above sea level. San Marino has several small rivers, but no bodies of water of any significant size. The climate is Mediterranean, with warm summers and mild winters. Its rugged terrain allows for limited agricultural products, which include wheat and other grains, fruit, cheese, and olives. Cattle and hogs are raised. 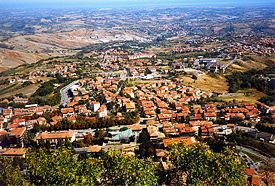 The history of San Marino is both very European and typical for the Italian Peninsula, and yet helps explain its unusual characteristics as the sole remaining Italian city-state. San Marino is the smallest independent state in Europe after Vatican City and Monaco and, until the independence of Nauru in 1968, was the smallest republic in the world. It is believed that the region had been inhabited since prehistoric times, although archeological evidence of existence on Mount Titano dates back only to the Middle Ages. According to tradition, San Marino was founded between 301 and 350 C.E. when a Christian stonemason named Marinus the Dalmatian, later venerated as Saint Marinus, after whom the country is named, fled from the Dalmatian island of Arbe to escape the persecutions under Diocletian, and settled in Monte Titano to ply his stonecutting and spread Christianity. Marinus hid on the peak of Mount Titano (the highest of San Marino's seven hills) and founded a small community following Christian beliefs. The owner of the land, Felicissima, a sympathetic woman of Rimini, bequeathed it to the little Christian community of mountaineers, exhorting them to remain always united. In honor of the stonecutter, the land was renamed "Land of San Marino," and was later finally changed to its present-day name, "Republic of San Marino." 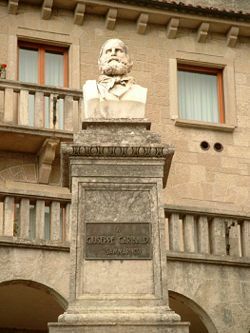 Bust of Giuseppe Garibaldi in San Marino, the first monument in the world dedicated to the "Hero of the Two Worlds." The work of Stefano Galletti, it was erected in 1882. By the mid-5th century, a community was formed. Documentary evidence, originating from a monk named Eugippio, reports a monk residing on the mountain as early as 511. Because of its relatively inaccessible location and its poverty, it has succeeded, with a few brief interruptions, in maintaining its independence. Later papers from the 9th century report a well organized, opened and proud community: the writings report that the territory by that time was ruled by a bishop. In the Lombard age, San Marino was a fief of the dukes of Spoleto. In the tenth century the abbots of the monastery were under the civil government, but they soon freed themselves and formed a free community. The original government structure was composed of a self-governed assembly known as the Arengo, which consisted of the heads of each family (as in the original Roman Senate, the Patres). In 1243, the positions of Captains Regent were established as the joint heads of state. The state's earliest statutes date back to 1263. The Holy See confirmed the ancient independence of San Marino in 1291. San Marino, having never engaged in war, has remained fairly peaceful. But to prevent other nations from attacks, it was seen necessary to construct the Three Towers of San Marino. In quick succession the lords of Montefeltro, the Malatesta of Rimini, and the lords of Urbino attempted to conquer the village, but without success. The land area of San Marino consisted only of Mount Titano until 1463, at which time the republic entered into an alliance against Sigismondo Pandolfo Malatesta, Lord of Rimini, who was later defeated. As a result, Pope Pius II gave San Marino castles and the towns of Fiorentino, Montegiardino and Serravalle. Later that year, the town of Faetano joined the republic on its own accord. Since that time, the size of San Marino has remained unchanged. The country adopted its written constitution on October 8, 1600. Even with the new constitution San Marino still faced potential threats. Thus a treaty of protection was signed in 1602 with the Pope, which came into force in 1631. San Marino has been occupied by foreign militaries three times in its history, each for only a short period of time. Two of these periods were in the feudal era. 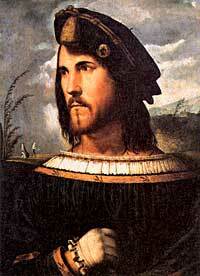 In 1503, Cesare Borgia occupied the republic until his death several months later. On October 17, 1739, Cardinal Giulio Alberoni, legate (papal governor) of Ravenna who in 1739, aiding certain rebels, possibly contrary to the orders of Pope Clement XII, used military force to occupy the country, imposed a new constitution, and endeavored to force the Sanmarinesi to submit to the government of the Pontifical States. However, civil disobedience was used to protest this, and clandestine notes sent to the Pope to obtain justice were answered by papal recognition of San Marino's rights, which restored them to independence. The state was recognized by Napoleon by the Treaty of Tolentino, in 1797 and by the Congress of Vienna in 1815. In both 1825 and 1853 new attempts to submit it to the Papal States failed; and its wish to be left out of Garibaldi's Italian unification in the mid-nineteenth century was granted, since it had offered a safe refuge to numerous supporters of unification in earlier years. After the unification of the Kingdom of Italy a treaty of 1862 confirmed San Marino's independence. It was later revised in 1872. The last occupation of the country was during 1944, though San Marino remained neutral in its own right. German forces retreat through the country to retreat, followed by Allied forces. The Allied armies only remained in occupation for as long as militarily necessary, only a few weeks, although 60 people were killed in that period. After the war, San Marino became the first country in the world to be ruled by a communist party through democratic elections. The ruling coalition of the San Marinese Communist Party and the San Marinese Socialist Party lasted from 1945 to 1957. San Marino is the only surviving Italian city-state. Like Andorra, Liechtenstein and Monaco, it appears an anachronism, a reminder of the times when Europe—particularly Germany, Italy and the Pyrenees—was made up of tiny political units, sometimes extending no further than a cannon could fire from a city’s walls. Various treaties of friendship have been signed with Italy since the latter’s unification, but San Marino proudly asserts its independence where possible. Women gained voting rights in 1960. Having joined the Council of Europe as a full member in 1988, San Marino held the rotating chair of the organization during the first half of 1990. San Marino became a member of the United Nations in 1992. In 2002 it signed a treaty with the Organisation for Economic Co-operation and Development (OECD), agreeing to greater transparency in banking and taxation matters to help combat tax evasion. The Honorable Fiorenzo Stolfi, Secretary for Foreign and Political Affairs and for Economic Planning of the Republic of San Marino and President of the Council of Europe, meeting with US Secretary of State Condoleezza Rice in Washington, DC. The politics of San Marino takes place in a framework of a parliamentary representative democratic republic, whereby the Captains Regent are the heads of state, and of a pluriform multi-party system. Executive power is exercised by the government. Legislative power is vested in both the government and the Grand and General Council. And the judiciary is independent of the executive and the legislature. Much like in the United States, and similar governments, citizens 18 years of age or older are eligible to vote. 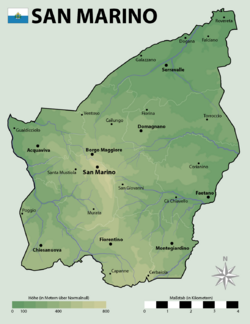 San Marino was originally led by the Arengo, initially formed with the heads of each family. In the 13th century, power was given to the Great and General Council. In 1243, the first two Captains Regent were nominated by the Council. This method of nomination is still in use today. The legislature of the republic is the Grand and General Council. The Council is a unicameral legislature which has 60 members with elections occurring every five years under a proportional representation system in all nine administrative districts. These districts, or townships, correspond to the old parishes of the republic. The practice of dual heads of state, as well as the frequent re-election of same, are derived directly from the customs of the Roman Republic. The Council is equivalent to the Roman Senate; the Captains Regent is comparable, to the consuls of ancient Rome. The Guard of the Rock in dress uniform during the investiture of the new Captains Regent in the Piazza della Libertà. San Marino has one of the smallest military forces in the world. Its different branches have varied functions including: performing ceremonial duties; patrolling borders; mounting guard at government buildings; and assisting police in major criminal cases. Although once at the heart of San Marino's army, the Crossbow Corps is now an entirely ceremonial force of about 80 volunteer soldiers. The Crossbow Corps since 1295 has provided demonstrations of crossbow shooting at festivals. Its uniform is mediaeval in design, and although it is a statutory military unit, it has no actual military function today. The Guard of the Rock is a front-line military unit in the San Marino armed forces (a state border patrol) with responsibility for patrolling borders and defending them. In their role as Fortress Guards they are also responsible for the guarding of the Palazzo Pubblico in San Marino City, the seat of national Government. In this role they are the forces most visible to tourists, and known for their colorful ceremony of Changing the Guard. Under the 1987 statute, the Guard of the Rock are all enrolled as 'Criminal Police Officers' (in addition to their military role) and act to assist the police in investigating major crime. The uniform of the Guard of the Rock is distinctively red and green in color. 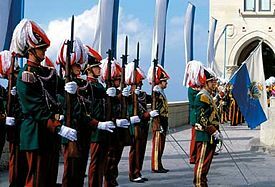 The Guard of the Council Great and General commonly known as The Guard of the Council or locally as the Guard of Nobles, formed in 1740, are a volunteer unit with ceremonial duties. 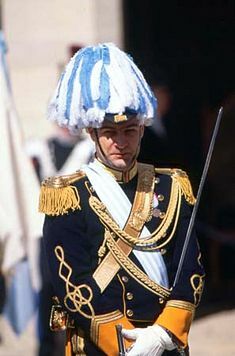 Due to its striking blue, white and gold uniform, it is perhaps the most well-known part of the Sammarinese military, and appears on countless postcard views of the republic. The functions of the Guard of the Council are to protect the Captains Regent, and to defend the Great and General Council during its formal sessions. They also provide a ceremonial bodyguard to government officials on festivals of both state and church. There is also a Gendarmerie, which is technically part of the military forces of the republic. The entire military corps of San Marino depends upon the co-operation of full-time forces and their retained (volunteer) colleagues, known as the Corpi Militari Volontari, or Voluntary Military Force. National defense in the face of an aggressive world power is, by arrangement, the responsibility of Italy's armed forces. San Marino is an active player in the international community, having diplomatic relations with over 70 countries. It also cooperates with UNICEF and the United Nations High Commissioner for Refugees and has official relations with the European Union, although it is not a member. From May 10 until November 6, 1990, San Marino held the semi-annual presidency of the Committee of Ministers of the Council of Europe. Italy maintains resident embassies in San Marino since they hold the Sovereign Military Order of Malta and the Holy See, for the state. 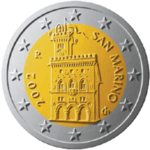 Although San Marino is not an official European Union member, it is allowed to use the euro as its currency by virtue of arrangements with the council of the European Union. It is also granted the right to use its own designs on the national side of the euro coins. Before the Euro, the Sammarinese lira was coupled to and exchangeable with the Italian lira. The small number of Sammarinese euro coins, as was the case with the lira before it, are primarily of interest to coin collectors. The tourist sector contributes over 50 percent of San Marino's GDP, with between 3 - 4 million tourists visiting annually. Other key industries are banking, electronics, and ceramics. Manufacturing includes building materials, textiles and wearing apparel, and food products. San Marino's postage stamps, which are only valid for mail posted within the country, are mostly sold to philatelists and also form a source of income. San Marino is a member of the Small European Postal Administration Cooperation. The main agricultural products are wheat and other grains, fruit, cheese, olives, and wine. The country must import many manufactured goods and much of its food, mostly from Italy. The per capita level of output and standard of living are comparable to those of the prosperous sections of Italy. San Marino has instituted taxes on corporate profits, capital gains, and interest earnings. In 1972, a Valued Added Taxation (VAT) system was introduced in Italy, and was applied in San Marino, in accordance with the 1939 Friendship Treaty. In addition, a tax on imported goods, to be levied by San Marino, was established. Such taxes, however, were not, and are not, applied to national products. Until 1996, goods manufactured and sold in San Marino were not subject to indirect taxation. Under the European Union customs agreement, San Marino continues to levy taxes, the equivalent of an import duty on imported goods. Later, a general VAT was introduced, in replacement of the Italian VAT. San Marino's railway network consisted of a single line, connecting the country with the Italian rail network at Rimini. Unable to access the capital, San Marino City (which has a mountain-top location), the terminus station was located at the village of Valdragone. The railway was opened on June 12, 1932. 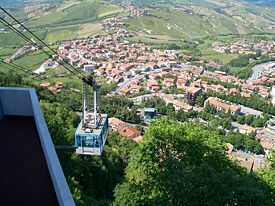 Aerial tramway to Monte Titano. It was an advanced system for its time, being an electric railway, powered by overhead electric cables. The trains drew power from these cables by means of a pantograph system. The railway was well built and well used, and in all probability would have been a long-term feature of Sammarinese public transport, but it was almost completely destroyed during the fighting in this region during World War II. Today there is no operational railway in San Marino. There are 136 miles of highways in the country, the main road being the San Marino Superhighway. Roads are well used by private car drivers. Sammarinese authorities issue private vehicles distinctive license plates that are white with blue figures with the coat of arms, and usually contain a letter followed by up to four numbers. Many vehicles also carry the international vehicle identification code, RSM (in a black on white oval sticker). There are no airports in San Marino, but there is an international heliport located in Borgo Maggiore. Most tourists who arrive by air land at Federico Fellini International Airport near the city of Rimini and then make the transfer by bus. Although there are two rivers that flow through San Marino, there is no major water transport, port or harbor. Montale tower on Monte Titano. There is no significant difference between the demographics of San Marino and those of Italy. The state has a population of approximately 29,000, including 1,000 foreigners, most of whom are Italians. About 5,000 Sammarinese live in foreign countries, predominantly in Italy. The native language is Italian, with the Emiliano-Romagnolo dialect. Roman Catholicism is the predominant religion of the republic. 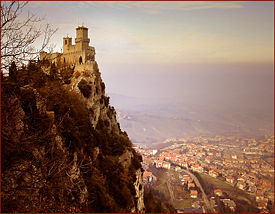 The Three Towers of San Marino are located on the three peaks of Monte Titano in the capital. They are depicted on both the Flag of San Marino and its coat of arms. The three towers are: Guaita, the oldest of the three (it was constructed in the eleventh century); the thirteenth-century Cesta, located on the highest of Monte Titano's summits; and the fourteenth-century Montale, on the smallest of Monte Titano's summits, is still privately owned. San Marino, enjoys football (soccer) as its most popular sport. The San Marino Championship, founded under the auspices of the FSGC (San Marino Football Federation), is the premier footballing competition in San Marino. The fifteen teams that take part in the competition are split into two groups of eight and seven teams. The top three from each section at the end of the regular season progress into a semi-knockout style Championship Playoff. Prior to 2007, the playoff champion earned a spot in the preliminary rounds of the UEFA Cup. In 2007, UEFA granted San Marino a spot in the 1st Qualifying Round of the Champions League. One of the Formula One races, the San Marino Grand Prix, is named after the state, although it does not actually take place there. It takes place at the Autodromo Enzo e Dino Ferrari in the Italian town of Imola, about 62 miles northwest of San Marino, along the Via Emilia. The race was etched in infamy after two fatal accidents occurred at the 1994 Grand Prix, when Ayrton Senna and Roland Ratzenberger were killed. San Marino has a rather successful professional baseball team, T & A San Marino, which play in the top division of Italian professional baseball; the Serie A1. The team has participated in the European Cup tournament for the top European professional baseball teams several times, hosting the event in 1996, 2000 and 2004, and scheduled to host in 2007. It won the championship in 2006. 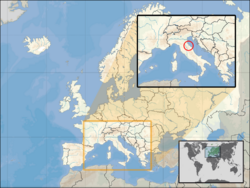 ↑ 1.0 1.1 CIA World Factbook entry on San Marino Retrieved November 3, 2011. ↑ UPECEDS, Popolazione, Government of San Marino (2009). Retrieved November 3, 2011. ↑ 3.0 3.1 3.2 3.3 UPECEDS, Conto della Generazione dei Redditi Nazionali, Government of San Marino. Retrieved November 3, 2011. ↑ 4.0 4.1 4.2 4.3 World Development Indicators, World Bank. Retrieved November 3, 2011. Note: "PPP conversion factor, GDP (LCU per international $)" for Italy was used. ↑ San Marino. UNECE Statistics Programme. UNECE (2009). Retrieved November 3, 2011. ↑ Law Library of Congress. San Marino. Retrieved December 19, 2007. All links retrieved August 18, 2015. CIA World Factbook. San Marino. Musei di Stato Repubblica di San Marino. Republic of San Marino. Centro Risorse Territoriale di Pesaro e Urbino. San Marino, a 1769 Guide. This page was last modified on 18 August 2015, at 14:38.